Rubenerd: The Emma Maersk is the real Big Blue! The Emma Maersk is the real Big Blue! Forgive the cheesy title, but you've got to admit especially compared to the one floating alongside that this is a big boat! And it's blue! She's the Emma Maersk, a container ship owned and operated by the A.P. Moller Maersk Group and named after somebody called Emma I presume. She's 357 metres long, 56 metres wide and 30 metres deep capable of carrying over 11,000 6 metre containers. The ship, not Emma who I assumed the ship was named after. 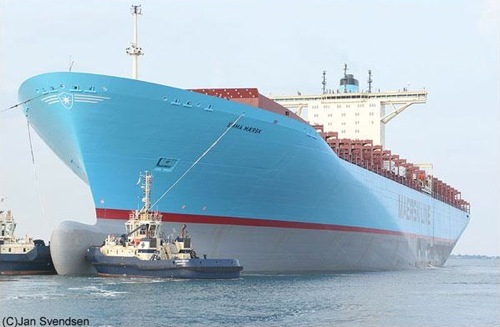 As with many of Maersk's latest vessels she is coloured a brilliant shade of cyan instead of a dull red or black; why don't more shipping companies do this? I was able to get an exclusive interview with the ship's builder at the Odense Steel Shipyard in Denmark, a small Nordic country in Europe populated mostly with Danish people. […] and so when building the Emma Maersk we wanted to strengthen Maersk’s corporate branding by painting the ship’s hull above the water line with their trademark blue. We also thought it would look trippy out on the open ocean because it would make the containers appear as though they were hovering in mid air. It’s just what that genius Ruben Schade said: "you can’t buy genius like that!" Wait, don’t post that. I of course fabricated that entire interview, surprising though it may seem. What got me interested aside from her striking colour scheme though were her environmental features. According to a New Zealand Ship Marine article which had some amazing photos, she features a sophisticated computer system with thousands of sensors to intelligently calculate the ideal throttle settings for the conditions the ship is facing in real time and a heat recovery system that helps to capture energy that in a similar ship would have gone to waste. And according to Robse.dk her hull is painted in a special silicon-based paint which lasts longer and reduces drag which delivers an estimated 1200 tons of fuel savings. Now all she needs is a few of those modern sails and we'd be in business. 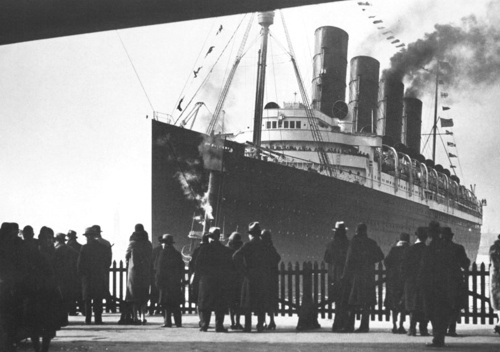 Granted the Emma Maersk isn't a passenger liner, but it's amazing what a century can do isn't it? Newer post ← Theming Gnome with purple is okay right?